What Is The Relation of Mary To Prayer? Protestants often have the impression that Catholics pray to Mary and other saints. Is that correct and what is the relation of Mary to prayer? Catholics believe that there is One Mediator between God and Man, Jesus Christ [1 Tim. 2:5]. They do not look to Mary as a mediator in the sense that Jesus is the Mediator. They believe that Mary [and other saints who have died] are more righteous that we are who are still on the earth, that the ones who have died can still hear and see us and that there is a unity between heaven and earth. They view asking Mary or other saints to pray for them as the same as asking other believers here on earth to pray for them [which is clearly taught in Scripture]. They do not view this as talking with the dead as in Scripturally forbidden occult practices, but with talking to brothers and sisters who are united with them in Christ - just not on the earth. Asking Mary or the saints to pray for something is more effective and logical than asking people on earth to pray [which they believe should also be done] because these saints are closer to God, are righteous, and no longer have a sin nature impeding them. So, assuming the above is a fair summary, is this practice really Scriptural? 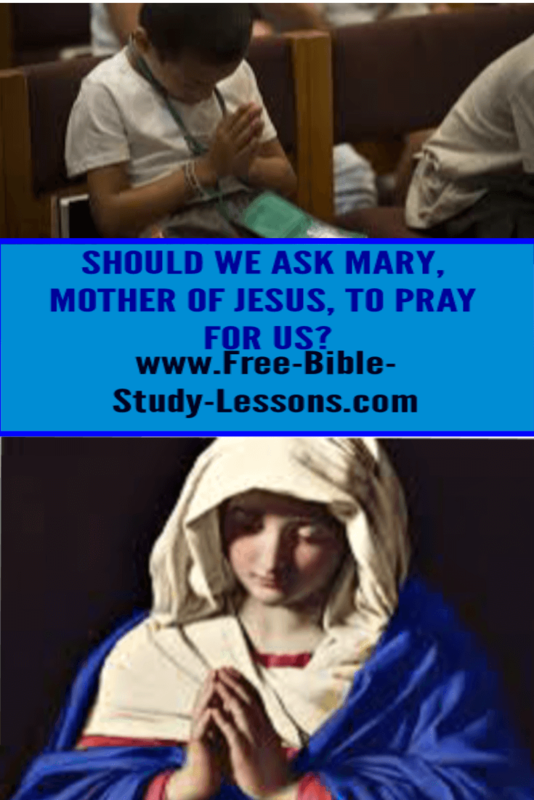 Is there a legitimate relation of Mary to prayer? There are some points we can agree on. Jesus is the only Mediator between God and Man. Those on earth and in heaven are united spiritually around the throne of God worshiping the Lamb. There are some indications that those who have died and are in heaven can observe things happening on earth [Heb. 12:1]. Those in heaven no longer have the sin nature that we on earth struggle with. Before we directly answer the question of whether there should be a relationship with Mary to prayer [or the other saints], there are several foundational issues we have to establish. We need to be sure we know who the Bible defines as saints. Paul teaches that all Christians are saints in the sense that they are holy ones or “set apart.” Catholics agree that the Bible teaches all Christians are saints, but they view them more as saints in the making while those who have been officially recognized as saints are fulfilled or completed saints. The process of being recognized by the Catholic Church as a “Saint” is a long and difficult one and involves examining the person’s life and teachings in detail, having one or more miracles attributed to them after their death, etc. [http://www.catholic.org/saints/faq.php] I do not find this process anywhere in Scripture and I believe it ultimately depends on a false system of “works” to make one righteous. Scripturally I see the word “saint” as descriptive of all Christians…period. Are the saints in Heaven more righteous than the saints on earth? The answer is both yes and no. There is no half-righteous just like there is no half-pregnant. You either are or you are not. We all come into this life with Adam’s sin nature and then compound it with our own person sins. We are all unrighteous by nature [Rom. 3:23]. We became righteous before God when we accepted, by faith, the work of Jesus Christ on the cross on our behalf. God then imputed Christ’s righteousness to us. Before God we are as holy and righteousness as Jesus Christ Himself. Is Christ going to get any more righteous than He is? Of course not. So being totally righteous is our position before God because of Jesus. In other words, in God’s eyes we can never become more righteous than we are right now. We know, on a practical level, that its revelation in our lives is a journey on which the Holy Spirit is leading us…a journey that will never be entirely complete in this life. So while Christians who have died have a greater practical righteousness - having completed their journey - as far as how God views His people they are no more righteous than we are. If God did not view us now through the perfect holiness of Christ we could not enter His presence or have any relationship with Him other than as Judge and condemned. So to view the prayers of the people in heaven as more righteous than ours in the sight of God is non-Scriptural. Notice where these two “proof” texts are found - the Book of Revelation. Yes, the Book of Revelation is Divinely inspired Scripture, but its interpretation is controversial. One the foundational principles of Bible interpretation is that you never establish a doctrine on unclear Scripture. You always start with plain Scripture and use it to explain the unclear or controversial ones. So, if these are the main two Scriptures to establish the saints in heaven pray with/for us, then the view is on shaky ground. As we look at the above Scriptures we see that they do, in fact, take place in heaven; however, all we are told is that the vials or the incense is the prayers of the saints. I see no reason to assume that they are the prayers of saints in heaven. They could just as easily be the prayers of saints [Christians] on earth which have come up to heaven and are being offered. Considering that no other Scriptures, that I am aware of, teach that saints in heaven pray for us, I believe that would be an unnatural assumption to make here. We are many times told to pray with and for each other, but never, in Scripture, are we told to ask for those who have physically died to pray with or for us. In fact, Paul, near the end of his life, said “I have fought a good fight, I have finished my course, I have kept the faith.” [2 Tim. 4:7]. When he entered heaven, his part was done. He did not expect to keep fighting for the faith by praying for others. That honour and duty is for those of us who are still in the battle. For those who have passed on, the battle is over. I know Catholics do not view asking the saints in heaven to pray with/for them as the same as talking with the dead in the forbidden Scriptural sense. However, in the 4,000 years of recorded Biblical history that are only two incidents [and three people] who have returned from the dead to speak with the living. The first one was Saul talking to Samuel [1 Sam. 28]. This was initiated by Saul and allowed by God for His own purposes. Saul was judged for his actions. The second one was Jesus talking with Moses and Elijah on the Mount of Transfiguration [Matt. 17:3]. Jesus referred to this as a vision [Matt. 17:9]. But, regardless of how you take it, it was a unique incident initiated by God, never repeated and certainly never promoted as a way of praying. So when it comes to prayer, we can pray to the Father, the Son [Jesus] and/or the Holy Spirit. Our prayers are never directed to anyone else. We can [and should] ask others to pray with and for us, but those others should be engaged in the battle with us [i.e. alive on earth]. The most we can say scripturally about those who have died and gone to heaven is that they may be able to observe events on earth - watching with wonder the amazing plan of God unfold and advance toward its ultimate conclusion. However, angels are the only created beings who are allowed contact with both worlds simultaneously…and we are not to pray to or with them. Does this take away from the honour and respect due to Mary, the mother of Jesus? Of course not. She has run her race. She has finished her course. And she is enjoying the presence of Jesus.